Please note that traffic and pedestrian access on The Mall will be restricted on Tuesday 1 November, please leave extra time to complete your journey to and from Mall Galleries. 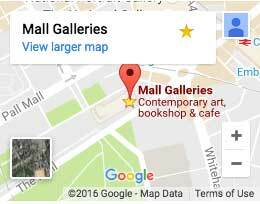 Admission: £3, Concession £2.50, Free to Friends of Mall Galleries, SWLA Friends and under 18s. This open exhibition celebrates the natural world in all its guises through drawing, printmaking, painting and sculpture. In addition to the huge array of contemporary approaches to conveying wildlife, there will be displays from the Society’s bursary winners and the Out of the Frame room will show fieldwork and sketches from the Society's Turkish Sweetgum Project and RSPB Wallasea Island Wild Coast Project. A visit to this show will give you a glimpse of the wild in the heart of London. Members of the Society of Wildlife Artists (SWLA) will be present in the gallery to talk to visitors about the Society and its 53rd Annual Exhibition. We know you love to talk about art, so come along and join fellow art lovers at our Mall Galleries Coffee Mornings and draw live tortoises!